Features Original Lexmark 50F1X00 toner cartridges are specifically designed to deliver professional quality results every time you print. Unlike bargain replacement toners, Lexmark toner cartridges are known for delivering the unmatched text edge quality for smoother images and crisper text. 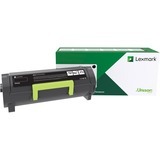 Lexmark 50F1X00 toner cartridges use advanced technology to measure and monitor toner darkness to ensure black is consistently black.